I love Hugo – but who doesn’t? This album is met with absolute positive in-favour-for-ears. It’s been seven years since he last put out an album in his own name. Hugo Rasmussen, the bass player, is still in demand as a musician on the live stage. In 2006 it was Hugo Rasmussen Allstarz and the album Precious Heroes and well it still is. 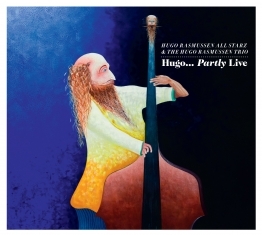 Nine compositions from the old days and one from the Allstarz-piano-player Heine Hansen is the repertoire on this album, which also include some recordings with Hugo Rasmussen Trio, which apart from Rasmussen is trombone player Mads Hyhne and tenor saxophone player Jakob Dinesen. Among other titles, they play I’ll See You in My Dreams and Where Are You? The trio is recorded at home in Hugo Rasmussen’s living room in 2008. It’s nice. The rest of Allstarz is playing songs like Stardust, Somewhere Over the Rainbow and Basin Street Blues. It’s trumpet player Kasper Tranberg who has chosen the last of the titles and his inner Louis Armstrong is finally brought out in the open. Hugo… Partly Live is not a grand album. On the other hand it represents the bridge which exists in Danish jazz between swing, good old days (when Hugo was young) and some of the sharpest, contemporary Danish jazz musicians. If they have to play swing, they have to do it the right way. And ‘The Hugo Way’ is always the right way.